for regulatory compliance and product information. RegulatoryOne replaces bespoke, manual systems with a single, authoritative solution for all your compliance and regulatory needs, providing you with the agility to respond to changing regulations. These efficiency gains improve your time to market, while providing transparency across your entire organization with each product release gate that a product passes through on its way to market. RegulatoryOne is a pure cloud offering that unifies and coordinates all facets of the regulatory process, providing you with visibility into what you’re selling, when you can sell it, and where it’s being sold – all in one place. Velocity to market: Today’s market forces demand that companies stay agile and responsive to meet regulatory changes and customer expectations. From quickly assessing the impact of a proposed product or formulation change, to locating the substantiating and source documentation, and finally coordinating activities on a global, regional and local basis, RegulatoryOne has you covered. Reliable data quality: Create a single source of truth for your product portfolio by capturing timely and accurate information. Information and content is stored once and can be accessed globally. This ensures data integrity as you coordinate product release processes across your stakeholders. Global coordination & alignment: As a cloud-based solution, RegulatoryOne seamlessly orchestrates compliance related activities across manufacturing sites, supply chains, outsourced manufacturers and all internal stakeholders. Product information is accurate, timely and accessible throughout the entire product lifecycle. 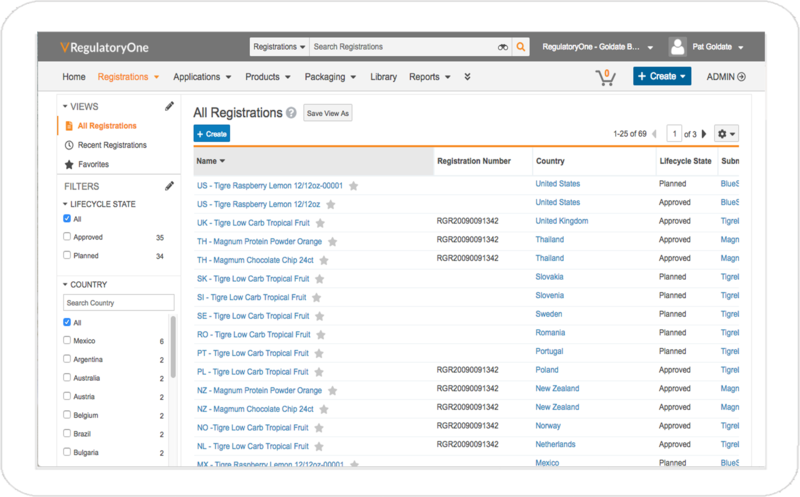 RegulatoryOne’s registration capabilities manage product registration information globally and is accessible by both internal and external parties at any time. Achieve a single, unified view of product data by registration status, by market, by variation and maintain communication with regulatory bodies. RegulatoryOne automates the planning, collection, review and approval of all product related content, prior to submission. This includes submission-ready documents, content planning and tracking, correspondence, product claims commitments and submission records. 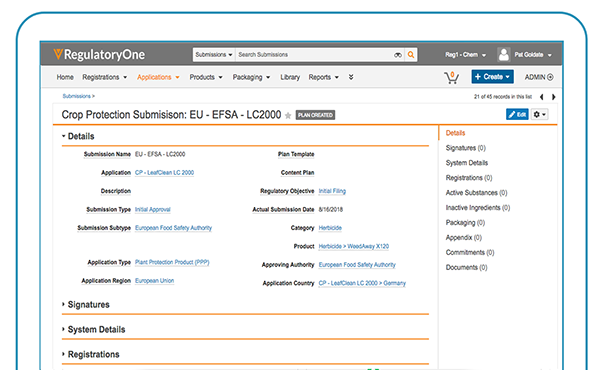 RegulatoryOne’s submissions capabilities provide you with full traceability for all your regulatory activities. RegulatoryOne publishing capabilities simplify your final product submission by alerting you to issues that you can proactively address during the authoring process. This continuous publishing process provides greater visibility and speed throughout the product release process and allows you to more dynamically respond to changing regulations across the markets you serve. Finally, a single source of truth and a complete archive for all your regulatory submissions. 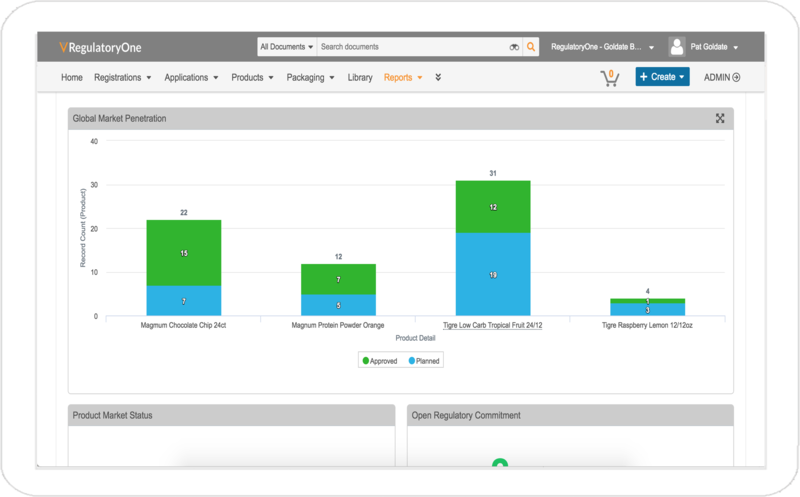 Imagine simple browser access to all your product submission components for authorized internal and external stakeholders to both use and reuse in local markets. 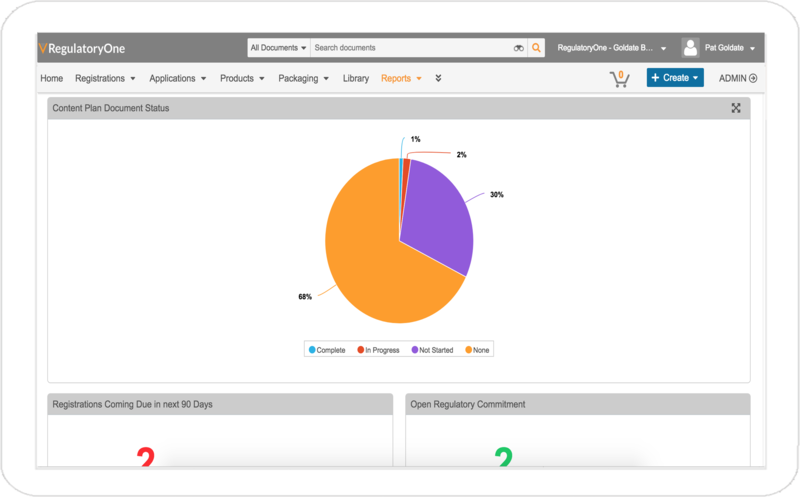 Ready to explore how Veeva can help you transform regulatory and compliance in your organization?